As many of you know, I have been making tile for my kitchen as part of a home remodel. Most of the tile is complete, and some is installed. In my dining area, there are beautiful new oak cabinets that will have a tile counter top and back splash. I want to make ceramic knobs for these cabinets. I first saw handmade ceramic knobs at the home of my potter friend Ted Juve, in Enterprise, Oregon. Ted explained to me exactly how to make them, and gave me a small bag of the threaded brass inserts that complete the knobs. I made my first knobs about a month ago, and cast them in plaster to make a press mold, so that I could make as many as I needed. The first knobs I made were too deep, and had to be hand cut after forming. 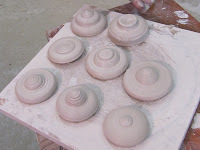 I decided to make a new batch to carve and cast in plaster, and include this fun process in my blog. I started out to throw some new knob blanks off the hump with my regular stoneware clay. I brought up a narrow column of clay, and formed a small knob with my fingers that was about 2 inches across. I added a little dimension to it, based on which of the first knobs I liked. The idea is that these new knobs will be just about the size that I want the finished knobs to be, accounting for shrinkage, so that I can just cut the knob to the finished size with a wire while it is in the press mold. I plan to shape the sides of the knob blanks when I trim the knobs in a tiny chuck later in the process. This will eliminate any undercut that might complicate the plaster process. You can see that I am cutting the the small knob off the hump of clay with a thread tool. This is a small bamboo knife – about 5 inches long – with a hole drilled in the rounded end. Then, a piece of stout linen thread (buttonhole twist from the fabric store also works….) is threaded through the hole and tied. I like about 6″ of thread. I use the bamboo clay knife to place the knob blank on a board to dry a bit for trimming. These knobs are finished by adding a 1/2 inch plug of clay at the back, and drilling a hole about about 1/2 inch deep into the extension to make a shaft to receive a threaded brass sleeve after firing. This permits the knob to be attached to the cabinet door just like you attach those boring (and expensive!) knobs from the hardware store. When these knobs have dried a bit, I will trim them and carve a little extra pattern into them. After that, I will join a section of extruded coil to the back to form the shaft. I am going to glaze these with the green lowfire glaze that I have used for my tile project, but also plan to finish some in the salt kiln. Hmmmm…….. that will be fun. can’t wait to see pictures of the finished project!